1. Stop all engines and auxiliaries. 3. Check bilges for fuel vapors. 4. Extinguish all smoking materials. 1. Maintain nozzle contact with fill pipe. 3. Wipe up fuel spills immediately. 2. Ventilate until odors are removed. 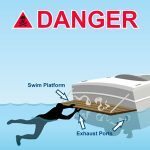 Several things to remember if gasoline is spilled into the bilge: (1) Do NOT operate the bilge exhaust blower. It can’t remove liquid and could make matters worse by creating a more explosive gas/air mixture. (2) Evacuate anyone near the boat. (3) Be sure the vapor-proof master battery switch is OFF so that no electrical equipment can start automatically. (4) Notify the marina management. If a professional manager is not available to take control of the situation, notify the Fire Department. (5) Open all doors and hatches to encourage evaporation. (6) The automatic bilge pump bypasses the battery switch. 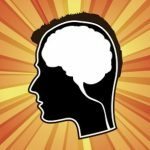 The pump should be disabled IF IT CAN BE DONE SAFELY. You can disable the pump by placing a weight on the float switch, or by raising the pump above the fluid level. And remember, if fuel is pumped or lost overboard, it must be reported to the National Pollution Response Center, 1-800-424-8802. Failure to report a spill will subject the owners to penalties. (7) Arrange for a mechanic or salvage contractor to remove the fuel. When filling gasoline cans at a service station, always remove the gas can from the vehicle and make certain that the can is grounded before filling. Several fires have occurred at service stations as a result of customers filling metal portable gasoline containers (gas cans) placed on plastic surfaces. such as the bed of a pickup truck with a plastic bed liner. The insulating effect of the plastic surface prevents the static charge generated by the gasoline flowing into the gas can from grounding. As static charge builds it can create a static spark between the gas can and the fuel nozzle. When the spark occurs in the flammable range in the gasoline vapor space near the open mouth of the gas can, fire occurs. 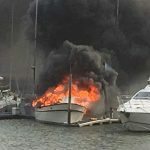 Boaters use ethanol instead of kerosene in their galleys because an alcohol fire can be extinguished by adding water. But don’t rely on it. A glassful of water suddenly splashed onto an alcohol fire can momentarily spread it, sometimes onto YOU. Keep a water dampened rag near an alcohol stove when cooking, or a box of sodium bicarbonate. And if the fire gets TOO rambunctious, don’t hesitate to grab your fire extinguisher and clean the mess up later. When planning a trip or day on the water, use the “1/3” rule for fuel consumption. Plan your trip so that you calculate fuel usage of 1/3 out, and 1/3 back. This will leave you 1/3 of a tank in reserve for those times when wind, waves, or drift make your running time longer than expected. Inspect fuel tanks annually. Pay particular attention to bottom surfaces which may have been in contact with bilge water. 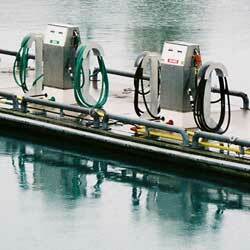 When refueling portable fuel tanks, take them out of the boat and fuel them on the gas dock. And, wipe off any spills or oil before reinstalling in the boat. Before refueling built-in fuel tanks, close all doors, windows, and hatches. Following the refueling operation, open up the boat and ventilate all spaces, especially the bilges and engine compartment. Check for fumes and inspect for water, oil, and fuel leaks. If your boat has a blower, run the blower for a few minutes before starting the engine. Recreational boaters are generally discouraged from carrying spare fuel aboard their vessel. 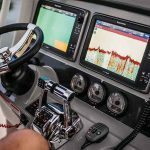 Although there appears to be no prohibition in the Federal boating regulations for carrying spare fuel, there are risks involved which justify avoiding the practice. If you do choose to carry spare fuel, be sure that you tranport the fuel in a container approved for that use, and in serviceable condition. The containers must be non-breakable and free of corrosion, have a vapor-tight leak-proof cap, and if vented they must be closeable vents. The container(s) must be secured in the boat in an area which is properly ventilated. Remember, filling a portable fuel tank from a spare fuel container presents an addition spill risk. The transfer should be done outside the boat and in a location where any spills will not contaminate the surrounding water or your bilge. Mishandling fuel and resulting spills can result in a citation and substantial fines, so it’s wise to avoid any unnecessary fueling hazards. 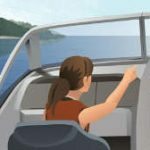 This spring and with little prior notice, recreational boaters in most parts of the country were introduced to gasoline containing higher concentrations of ethanol, a corn-based additive that replaced a known carcinogen, MTBE. The new fuel, dubbed “E-10” for its 10% ethanol content, unfortunately has the ability to attract greater amounts of water and “phase separate,” or form two separate solutions in the gas tank, usually over a long period of time. Once this happens, the engine won’t run and internal damage could occur. Once phase separation occurs in E-10 gasoline, additives and water separators can’t help. The only remedy is to have the gas and ethanol/water professionally removed from the tank. With any fuel that sits in a tank for a long time, it’s important to add a stabilizer. But understand that stabilizers do not prevent phase separation. E-10 has been a fact of life in certain areas of the Midwest for over a decade and there have been relatively few problems. The best practical recommendation learned from marina operators in the region is to top off a boat’s fuel tanks to about 95% full, leaving room for expansion. A tank that is almost full limits the flow of air into and out of the vent, which reduces the chance of condensation adding water to the fuel. Draining fuel tanks of E-10 gas, while completely eliminating any chances of phase separation, is potentially dangerous and an impractical solution. Whether you believe your boat’s fuel tanks are half full or half empty, leaving a tank partially filled is a bad move. A Midwest marina owner confirmed that phase separation problems typically occurred when boats were stored over the winter with tanks only one quarter to one-half full. In the summer, infrequently used boats with partially filled tanks are also prone to phase separation. Never try to plug up a fuel tank vent to prevent moist air from entering a tank. Without room to expand, the additional pressure could rupture fuel system components.